Today was picturesque. The morning breeze was nippy, but once Ol' Sol cleared the eastern horizon, and the shadows shortened, the weather was stunning. We were fortunate last night as the bad weather system split apart and straddled us. There were warnings to the north and to the south, but we didn't get a drop of rain. Today, I worked around outside the house, and Jilda worked inside. We did things we'd be putting off for months. Maybe it was the weather that gave us energy, but our spirits soared. At the end of the day, several of the things on our todo list were checked off. Jilda's brother came over and brought one of his grandsons to play in our backyard. While he threw a ball and the dogs fetched, we all sat there and chatted. Mostly we sat there enjoying the moment...being alive. After they left, I started inside and realized I hadn't dumped the compost bucket in a while so I decided to do that chore too. The bin is under the pear tree, and I tapped the bucket empty which sounded like a kettle drum. Afterward, I stood there a long time absorbing the moment. 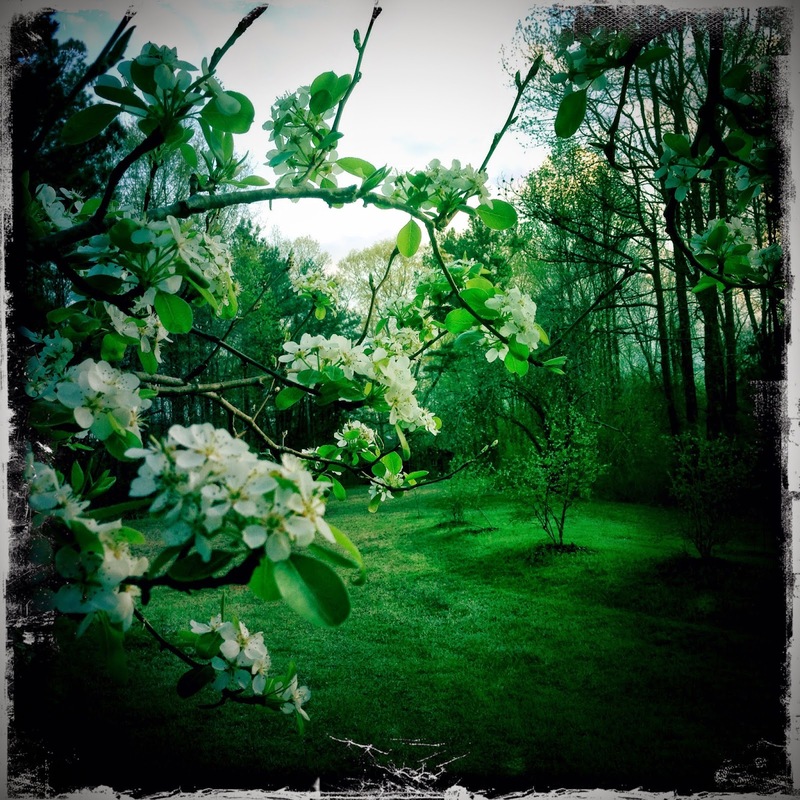 Through the pear blossoms, I could see the blooming blueberries and one end of the garden. I snapped a photo to document the moment, but the picture doesn't do it justice. I hope you all have a blessed Easter Sunday. You had a productive yet pleasant day. They should all be like that. Happy Easter to you. Your picture is a symphony in green. Happy Easter. It is oh so nice to have a 'back yard' that is fun, and also invite-able. I love to picture a boy, a ball and dogs. Love the green and white. Happy EAster. It sounds like you had a great day and this picture, to me, is so beautiful-the greens just pop! Truly, truly, a day to remember. Beautiful picture. Thanks for your comment on my blog. Happy Easter to you and your family. Such a beautiful place you have to spend time in there. Your picture is just full of Easter Joy! Hope you both have a wonderful and Happy Easter ! Wow. Stunning. Blanketed in greens. We must not be too awful far from each other, because it seemed the worst of the weather went north and south of here, too. Though we did get some rain and a few rumbles of thunder.